Batesville's economy in the late 1800s took a significant leap forward with the arrival of the Big Four Railroad. The natural water wells along the way helped make Batesville's bid for the train become a reality. The first train station in Batesville was at the SE Corner of Depot and Pearl Streets which relocated and later on became the Romweber manufacturing facilities. The spring fed well that provided water for the train is still in existence on Depot Street between the two Romweber buildings. The Big Four Railroad served Chicago, Cleveland, Cincinnati and St. Louis and was later consolidated with the New York Central. 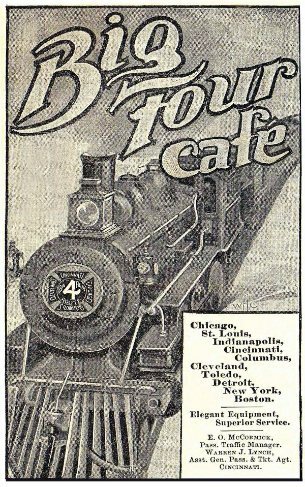 Restaurants called "beaneries" along the route sprung up offering meals to travelers. The Big Four Tavern opened in the mid-1800's at the NE Corner of Depot and Pearl Streets. The Tavern operated until 2011 when it was damaged beyond repair in a wind storm and the building was demolished. The Big Four Café will be open to the general public and will provide activities for area seniors.